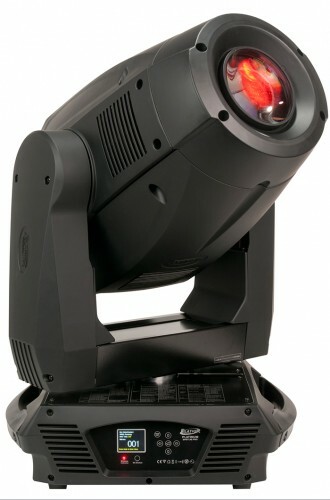 Elation Professional takes advanced Philips MSR Platinum lamp technology to the next level of brawn and brightness with the Platinum Spot 35 PRO, an 800-watt, feature-packed moving head spot fixture that’s ideal for large stages, amphitheatres, sports arenas, and major concert tours. Featuring the biggest, most powerful Platinum lamp source used by Elation to date -- the 55,000-lumen, 7,800°K MSR Platinum 35 – the Platinum Spot 35 PRO delivers up to 76,880 lux @ 5 meters (at minimum 8° zoom). Yet, like all Elation Platinum Series fixtures, it’s energy-efficient relative to its output and features a high quality optical system that provides the power and sharpness professional applications require. Not only is the Platinum Spot 35 PRO powerful enough to illuminate the largest venues and events, its incredible palette of creative tools makes it a lighting pro’s dream to work with. The possibilities for designing stunning lightshows are unlimited with features that include: variable CMY and CTO colour mixing; a static dichroic color wheel with 8 interchangeable colours (including UV); two gobo wheels with total 12 interchangeable glass rotating/indexing gobos; 3-facet rotating/indexing prism with 16 prism macros; frost filter; two-direction rainbow effect, and an animation wheel effect. The Platinum Spot 35 PRO also offers 0-100% mechanical dimming, a high-speed mechanical shutter/strobe, and sweeping-motion 540°/630°pan and 245°tilt. Plus, with premium features such as an 8°-50° motorized focus/zoom system; motorized iris (5%-100%); and 16-bit resolution on all motor functions, it truly lives up to its name as a "PRO" in handling a wide range of lighting demands with precision and accuracy. "As the largest and brightest addition to our Platinum Series by far, the Platinum Spot 35 PRO represents an exciting benchmark," said Eric Loader, director of sales for Elation Professional. "Our Platinum lamp series has brought a new degree of efficacy and energy savings to the market in recent years, because its optical performance can compete with older technology discharge lamps that utilize almost twice the power. "Now we’ve taken Platinum technology to a much higher output level with the Platinum Spot 35 PRO. When you combine its powerful, efficient lamp with just about every feature a lighting pro could want– CMY, CTO, zoom, 16-bit resolution, frost, etc. – you see that this is truly a unique and terrific fixture. We believe it’s the ultimate 800-watt moving head spot for today’s market." From a user’s standpoint, too, the Platinum Spot 35 PRO incorporates today’s most coveted features and conveniences. For starters, it includes a built-in EWDMX wireless DMX receiver that allows it to receive DMX signals wirelessly from up to 3,000’ when used with an Elation EWDMX transmitter (sold separately). The unit also comes equipped with 3-pin and 5-pin DMX connections. Three DMX channel operational modes (27/29/41) are available for versatile programming options. The Platinum Spot 35 PRO can also be run manually in Sound-Active and Master-Slave modes. It features built-in auto program macros, plus a microphone for triggering these programs via sound activation. A 6-button touch control panel with a full-color 180° reversible menu display makes it easy to navigate through DMX and manual settings. As an added convenience, the display has its own rechargeable battery backup. Other features on the Platinum Spot 35 PRO include pan/tilt lock, PowerCon In, and a multi-voltage universal auto switching power supply: AC 100-240V, 50/60 Hz. The unit measures 19.9"L x 17.6"W x 28.6"H/506.5 x 447.3 x 726.5 mm, and weighs 79 lbs./36 kg. CE and cETLus approval are pending.